Welcome back to our series on the weird world of quantum measurement! In the last post, we looked at the Heisenberg uncertainty principle and discussed how we should not pin the blame for our uncertainty on our measurement technique. Measurements do, though, play a very important role in other areas of quantum mechanics. Today, let’s explore what we actually mean by a “quantum measurement" which is popular in college academics, and some high school academics. As with many things, the concept of measurement becomes strange and fascinating once you take it into the quantum world. This isn’t just holding up a ruler or clicking a stopwatch! The concept of a quantum measurement, like most topics in quantum mechanics, is best explained through analogy. We’re entering a world where everyday objects act in a way that seems nonsensical to our intuition, where you can do truly weird things with a flick of your thumb. We’ll imagine that we have a quantum coin, a quarter that is perfectly ordinary in every way except that it obeys the laws of quantum, not classical, physics. On the scale of actual quantum objects, a quarter is immense, huge, inconceivably large, but we can use our imagination. So if you’re ready, let’s take leave of our classical intuition for a minute and dive in! The quantum coin has two, and only two, possible classical states – heads and tails. When we look at the coin, we either see Washington or we see the eagle, and that’s it. Because our coin is a quantum coin, though, it can also exist in a superposition of its classical states. When we’re not looking at the coin – that is, when we’re not measuring its state – the coin can be both heads and tails at the same time! A simple measurement – heads or tails? The concept that an object can be in two (or more) states at once can be confusing because this type of superposition simply does not exist in our human-scale world. Let’s think about how we would measure the state of the coin, and hopefully the concept of what it means for the coin to be in a superposition of heads and tails will become clearer in the process. Imagine that you are holding our quantum coin in your hand. You flick it with your thumb so that it spins upward through the air. As it falls, you catch it and slap it down onto the back of your other hand. Finally, you lift your hand, look at the coin, and the measurement has been completed! Of course, this measurement is simple – the very stereotype of flipping a coin. If we look at it in more detail, though, we will see that it reveals quite a bit about how we measure actual quantum systems in the lab. It’s an important point that we don’t care about the state in which we first found the coin. It could be heads or tails, or we could have just picked the coin up off the street. To put the coin in the state we want to measure, we simply flick it upward. We can imagine that the coin, as it flips head over tail up into the air, is in a superposition state. We can imagine the coin flipping so quickly that it becomes a blur – both heads and tail at the same time. This is state preparation – we find the coin in some random unknown state, and flick it to put it in the desired superposition state. In general, we might want to use our quantum system to measure something else. Quantum states evolve over time; that is, you create one superposition state, and it changes over time into another one in response to its environmental conditions. For example, quantum systems are now being used to measure temperature, electric fields, and magnetic fields with unparalleled precision and resolution. We might use our quantum coin, for example, to measure the wind speed in the air above our heads. To measure the wind speed, we flick the coin up into the air, let the coin interact with the wind for some amount of time, then measure the new state of the coin. Wind will change our quantum coin’s superposition state in some way, so by measuring the coin’s state after it has interacted with the wind, we can measure the wind’s speed. Now comes the most interesting part of this process: measuring the state of our coin. As the coin falls back toward you, flipping around in its superposition state, you slap it down onto the back of your left hand. Now, you have forced the coin into one state or the other; between the back of your left hand and the palm of your right, the coin is definitely either heads up or tails up. This phenomenon is called wavefunction collapse. A quantum system can exist in a superposition, but we can never measure the superposition directly. As soon as we make the measurement, we force the system to choose one of its classical states and we observe the result. Let’s consider the situation before you have lifted your right hand off the coin: you have made the measurement – you have forced the coin into one of its two classical states – but you do not yet know the result of your measurement. People like to ask all kinds of epistemological questions about quantum measurement. If no one was looking at the measurement result, or if the computer failed to record the result, was a measurement still made? I hope this example convinces you that yes, you can make a quantum measurement even if you do not record the result. As soon as you have interacted with the coin – slapped it down onto your hand – you have forced it into a classical state, even if you do not yet know which state that is. Finally, you lift up your hand, look at the coin, and complete the measurement. Procedurally, this step is fairly straightforward. You simply lift up your hand and look. In the lab, electrical signals travel to the computer, which plots a point on some graph. The coin can be in any superposition state – 50% heads 50% tails, 99.9% heads 0.1% tails, or even 0% heads 100% tails. The superposition state of the coin can only tell you statistically whether you will see George or the eagle when you lift your hand. If the superposition is 0% heads 100% tails, then you know you will always see measure tails. If, on the other hand, the superposition is 50% heads 50% tails, then you know you will measure heads and tails roughly equal numbers of times, but you can never predict the result of any individual measurement. This is, in effect, the dice-playing God that Einstein famously railed against. The concept of different superposition states also explains how we can use our quantum coin to measure the wind speed. Let’s say that you flick the coin in such a way that you create a 50% heads 50% tails superposition state. 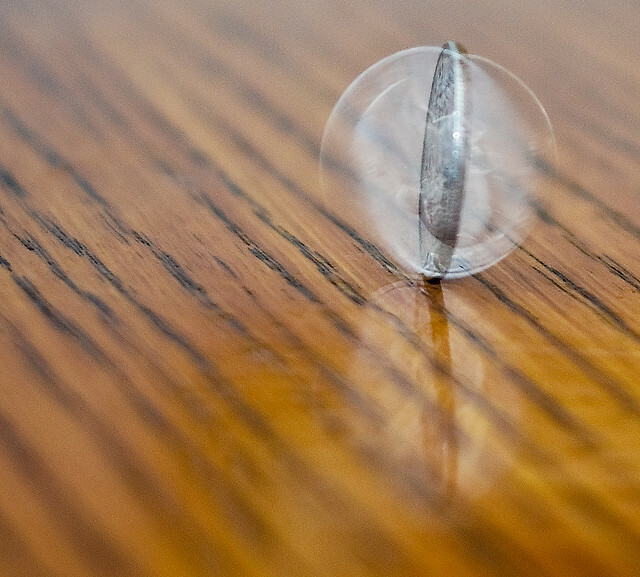 If, after you’ve measured the coin many times, you notice that the coin lands heads up 75% of the time, then you can conclude that the wind altered the state of the coin while the coin was in the air. If you understand in theory how the wind and the coin interact, then you can work backward to deduce the speed the wind must have to cause the change you observed. As a physics tutor, I hope that this analogy has given you a sense of the basic characteristics of a quantum measurement. First, a quantum system can exist in a superposition of different states, but a measurement will force it to choose one state or the other. Second, the superposition state will determine statistically what you will observe when you measure the system, but it will generally not tell you which state you will observe in any given measurement. Tune in next time, when we’ll explore some weird examples of quantum measurements!